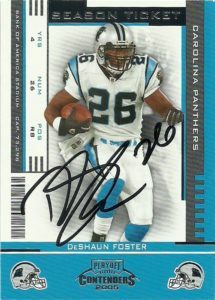 I remember DeShaun Foster playing for UCLA back in I think it was 1998. The University of Texas was beginning to feel its oats again, and big things were expected out of the Longhorns that year. UCLA was the home opener- and well, Foster and the Bruins blew the doors off of UT. Over his 4 years in LA, DeShaun rushed 696 times for 3087 yards and 39 TDs. 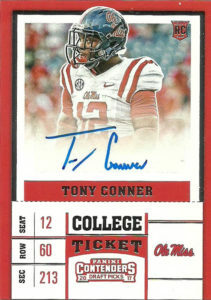 He’d be selected in the 2nd round of the 2002 NFL Draft by the Carolina Panthers, but be injured during the preseason. He’d return in 2003 and be paired up in the backfield with former Redskin Stephen Davis. Davis was more of a straight ahead between the tackles back, while Foster was a slasher with good speed. It wouldn’t be until 2005 that Foster surpassed Davis in the lineup as the primary starter. Over the next 3 seasons, he’d post almost 3 identical seasons hovering between 875-900 yards rushing. He’d sign with the San Fransisco 49ers where he played a final season in 2008. Afterwards he had a tryout with the Rams but did not make the squad and opted to retire. Foster went into coaching first as a volunteer assistant at UCLA in 2013, and then later in 2016 as the RB coach at Texas Tech. 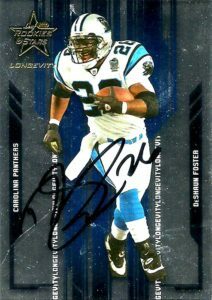 He rejoined UCLA in the same capacity in 2017, where he kindly signed these 2 cards of his in less than a month’s time. 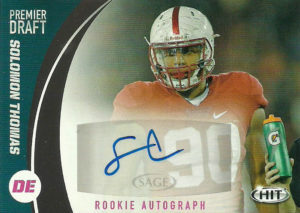 Solomon Thomas played for the Stanford Cardinal and is considered a blue chip prospect in the 2017 NFL Draft. A two year starter at strongside defensive end, he recorded 98 total tackles, 24.5 tackles for losses, 12 sacks, and 4 fumble recoveries. Well conditioned, teams raved about his sideline to sideline impact, and likened him to Justin Smith. The feeling is that the sky is the limit for Solomon as he grows into his full potential in the pros. It was expected that Thomas would not make it out of the top 10 in the 2017 NFL Draft. The draft opened as expected, but the Bears traded up with the 49ers one slot to grab Mitch Trubisky in a stunner move, and handing SF a few picks in the process. It is unknown if the ‘9ers coveted Trubisky at all, but they quickly then turned around with the 3rd overall pick and selected Thomas where it is expected that Solomon will contribute early in his career with the team.